What is PiYo ? PiYo is a type of exercise that combines the muscle-sculpting, core-firming benefits of Pilates and the strength and flexibility advantages of yoga into one fun, intense and fat burning session. Unlike your standard Pilates and yoga classes that focuses on repetitive microscopic core movements, PiYo actually speeds everything up by introducing a dynamic and flowing sequence of movements that has been proven to burn serious calories while lengthening and toning your muscle at the same time. WHY SHOULD I TRY PiY0? Every fun, intense and action pack session, will truly make you sweat, burn excess fat and definitely helps to sculpt and define your body. No matter your age, no matter your body type, or your fitness level, PiYo will help you reach your fitness goals. WHAT ARE THE BENEFITS OF PiYo? • Sculpt long, lean muscles all over. • Get your cardio, strength training, and stretching all in each workout. • Use your body to shape your body without lifting a single weight. • Burn crazy amounts of calories without joint-straining jumps or high-impact cardio. • Improve your balance and core power. • Perform flowing yoga- and Pilates–inspired movements without the boring poses or microscopic repetitive movements. • Meet new friends to keep you accountable. • Perfect your form with the help of a PiYo LIVE Instructor. • Rock out to your favorite music tracks with cranked-up volume. • Look forward to class and perfecting your PiYo LIVE body. • Feel empowered and have fun! All in a one-hour class! JOIN OUR MASTERCLASS THIS MARCH! Come take a class to define exactly how you want to look! Hope Pilates is proud to announce that we will be having Piyo classes soon! 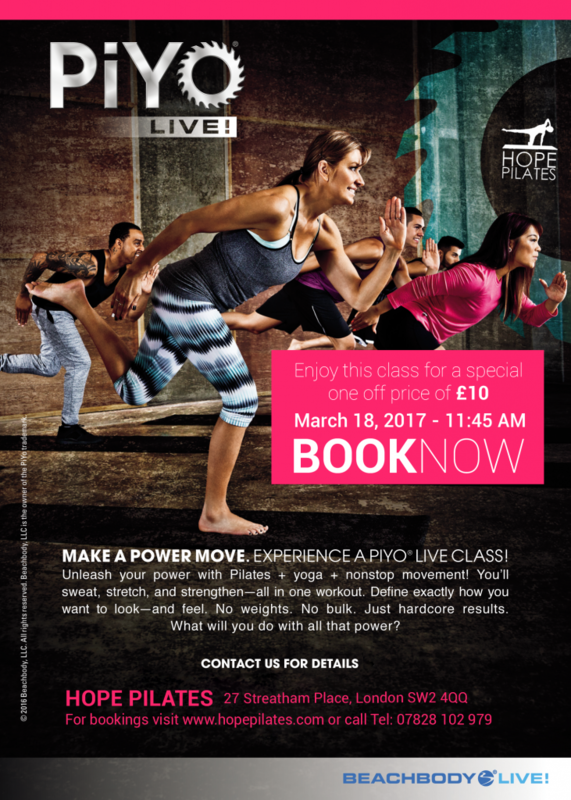 Come and enjoy our PiYo Masterclass this March 18, 2017 at 11:45 AM here at the The Hope Centre. Enjoy a special one-off price of £10. Drop in fee is £15. So enjoy a £5 discount! You have to be 18 years old and above to take this class. We encourage you to bring your own yoga mat, sweat towels, socks and water if you get thirsty. The class is optional shoe on or shoe off. Further inquiries or an alternative booking line, please call on 07828 102 979. Alternatively, email hopepilates@gmail.com. No cancellation, exchanges or refunds. Yes please, a copy of your ticket will be needed.